Akoumia Symiaka (means doughnuts or donuts from Symi island). Symi is a small island of the Dodekanese to the north of Rhodes. These akoumia are not widely known even by Greeks because they are Symi’s local traditional doughnut recipe and are made only on the island of Symi. 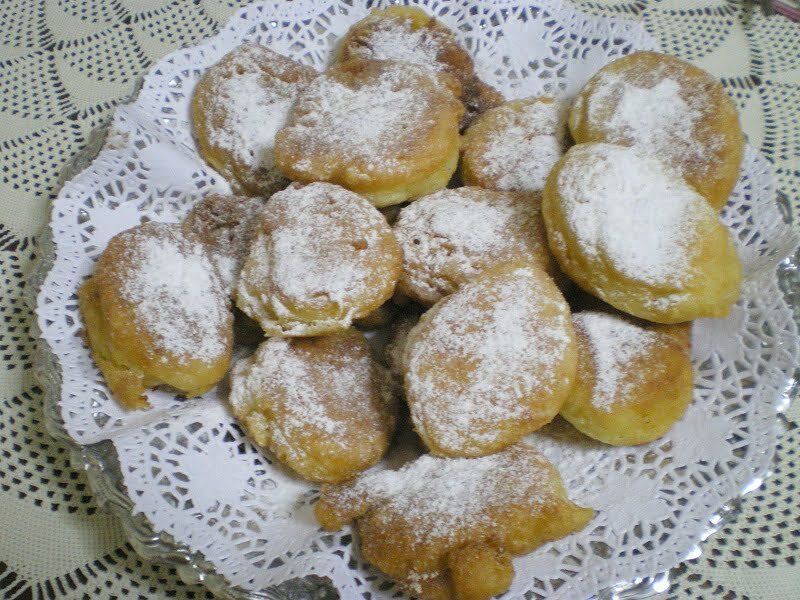 These doughnuts are unique because apart from the usual doughnut ingredients, flour, yeast, sugar, salt and water, they have boiled rice in them (the taste of which is not noticeable) and are flavoured with orange and ouzo. Doughnuts are considered to be the “Sweet of joy”, as they call it in Symi. Whenever a happy occasion occurs on this remote island, whether it is an engagement, a wedding, the birth of a child, the christening of a child, the first tooth of the child, a birthday or a name day, they make these wonderful doughnuts out of the simple ingredients everyone have at home. During the New Year’s Eve they put a coin in one of them and whoever finds the coin is considered to be the luckiest for the whole year. I shall give you both the original recipe as well as my twist of it. The original recipe I saw on Anna Drouza’s T.V. show last year when she was still at the National Channel E.T.2 presented by a Symian woman. I can still remember the reactions of the audience who tried them. Their reactions and comments were enough to convince me that I should try them and the first time I made them was shortly after the TV show. However this recipe is for mass production. It will make about 100 doughnuts. Dissolve the fresh yeast with lukewarm water. Add flour and make a batter which is still soft and watery. Add remaining ingredients (except oil) and leave them again to rise and they are ready to be fried. This is my twist to the recipe. Instead of ouzo I added Grand Marnier (orange liqueur), I used dried yeast, a different type of starchy rice called Carolina and fried them in mild olive oil. Boil rice for about 30 minutes and keep one glass of water before draining the rest. Place flour, dry yeast, orange rind, sugar and salt into a bowl and mix them. Add the lukewarm rice water and mix to make a batter. Add the rice, olive oil, orange juice and orange liqueur and mix well. Cover with a clean napkin and leave about an hour to rise. In a skillet heat the oil. Place the dough in the frying pan by using a spoon which occasionally dip into a glass of water, so that the dough may easily slide into the skillet. Fry on both sides and remove on kitchen paper to drain excess oil. Serve by sprinkling some icing sugar mixed with cinnamon on top or serve them for breakfast with some Greek thyme honey, as I did. Add the rice, oil, orange juice and orange liqueur and mix well. Cover with a clean napkin and leave about an hour to rise. Carolina rice is a starchy rice, similar to Arborio. Ivy, these look absolutely delicious! (As do your other recent posts – I’m just catching up after a way too busy week.) I’m really happy to learn about this traditional treat (although if I lived at your house I would be gaining weight very quickly!). Thanks Laurie, It has been a really busy week for me as well, so am I trying to catch up. As for the rest, I am trying to keep a balance and cook other healthier meals in between. These look great, Ivy! I didn’t come across these donuts until this morning and I have never had them before but they look SO good. I will have to give these a try. Glad you liked them, yours too were great. I’ve never heard of the Akoumia from Symi but they do sound and look divine. Greece is so small yet still so diverse…I love it! Thanks PeterX2 (lol) That’s really why I did not post about loukoumades which was much easier for me but Symi is an island worth mentioning and visiting, so a few people might learn about this beautiful island. You are so right Nuria but how are we going to start a diet, I don’t know. Tomorrow I promise to post something light. Thanks for this Ivy. It’s been going down very well for us here in Symi. Thanks for this Ivy. It’s been going down very well for us here in Symi! Hi Jordan, I’m glad you finally made it. My regards to all the Symians. These look terrific, especially with the honey. And donuts containing ouzo have to be good! Oh look at the honey on them. Makes me wanna lick the screen. I love your comment, made me laugh. Akoumia, hmm, sounds nice. And the doughnuts look delicious. I have been discovering an number of doughnuts from around the world.